An absurdly entertaining open world playground thats at its best when it breaks away from script. Shame about those tailing missions. What is it? Open world shooter set in the Himalayas. Ajay Ghale travels to Kyrat, a fictional region of the Himalayas, to scatter his mother’s ashes. But, by a quirk of fate, finds himself in the service of the Golden Path, an army of freedom fighters founded by his late father. They’re locked in a brutal civil war with Pagan Min, the despotic ruler of Kyrat, and it’s up to you—the prodigal son—to free it from his tyranny. It’s a neat twist on the classic Far Cry setup. You are, as in earlier games, a tourist stranded in an exotic, dangerous, alien place, but now you have a more personal reason for being there. Pagan Min is a colourful villain in the James Bond mould, and is—as Vaas Montenegro was in Far Cry 3—one of the highlights of the game. He once had an affair with Ajay’s mother, and as a result has taken a special interest in him. To hammer home the fact that he’s a deeply unpleasant character, an early scene sees him wetting his finger, dipping it into her urn, and tasting her ashes. Yes, really. But like any good Bond villain, his charisma and eccentricity means you’re torn between wanting to defeat him and see more of him. Ajay doesn’t say much, which instantly makes him an improvement over the last game’s endlessly punchable frat boy hero Jason Brody. Really, though, Min is the real star of the game, and Ajay feels more like an empty vessel for the player than a meaningful character. But you still care about his story, because he’s propped up by a memorable cast, including the two feuding leaders of the Golden Path, Amita and Sabal. Both have wildly different opinions about how to take Kyrat back from Min's clutches, and you’ll have to step in occasionally to make their decisions for them, which affects the way certain missions play out. But let’s take a moment to talk about Kyrat itself. This is a stunning landscape of fog-shrouded mountains, forested valleys, shimmering rivers, and rolling plains. While Far Cry 3’s Rook Island was vividly bright and colourful, here the colour palette is muted and autumnal. The Himalayan flora and fauna give it a very different feel, and it reminded me a lot of Skyrim in places. 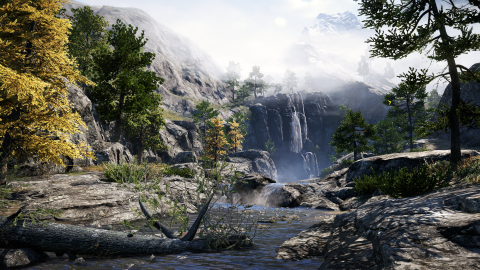 The map is large and open, but flanked by towering, snow-capped mountain peaks, and the scenery and atmosphere change subtly as you travel from the lowlands to the highlands. It’s a beautiful place to exist. It’s also an insanely entertaining playground, and I’ve had more fun here than I ever did in Far Cry 3’s tropical archipelago. Kyrat is full of sheer drops, huge mountains, rocky cliffs, and deep valleys. The terrain is remarkably varied and vertiginous, which lets you take full advantage of the wingsuit—which you can now buy from a shop straight away. The feeling of sprinting towards the edge of a mountain, leaping off, and floating down gracefully into a valley is absolutely exhilarating. Gyrocopters have also been added, and they’re a lot of fun to buzz around in. There are new land and water vehicles, like hovercraft and hilariously rickety tuk-tuks, but you’ll spend most of your travel time in the air. The grappling hook is another new addition, and Ajay can use it to clamber up or abseil down vertical surfaces and swing across gaps. You can only attach it to pre-defined points, though, which is slightly disappointing. I’d have loved the ability to attach it to any surface. The variety of ways to traverse Kyrat means traveling from place to place never feels like a chore. Wildlife is an important part of the Far Cry series, and Kyrat is teeming with exotic creatures, most of which want to kill you. There are colossal beasts like elephants, rhinos, and black bears, as well as monkeys, honey badgers, and eagles. This abundance of fauna makes your surroundings feel brilliantly alive, and random animal attacks are a constant source of amusement. Tigers will pounce on you, eagles will grab you, elephants will flip your car over, and killer bees will swarm you—sometimes all at once. But, equally, animals will attack enemies, often to your advantage. I once sat back and watched as a rampaging elephant cleared out an entire outpost for me. Far Cry 4 maintains a steady 60fps at ultra/1080p on my Nvidia review rig (see ‘Need To Know’ for full specs), with some noticeable, but not game-breaking, micro-stuttering when flying across the map at high speeds in a gyrocopter. On my 2GB Radeon HD 7870 at home—with an Intel i7-950 @ 3.07GHz and 6GB of RAM—it hovers around 45-60 on very high/1080p, but with constant stuttering and pausing, which worsens significantly when the game reloads after I die or fast-travel. Other AMD users (including PC Gamer editor Sam Roberts) have reported the same issue, as have several benchmark websites—even on high-end AMD cards. Nvidia GPUs seem to be largely unaffected, however, and if you have one you can take advantage of TXAA anti-aliasing tech. Like Far Cry 3, the game is split between story missions and outposts. The story missions are bombastic, scripted, and big in scale, like an absurd action movie, while the outposts give you the opportunity to really play with the game’s systems. Both are entertaining in their own way, but it’s during outpost raids where things get really good. Choosing how to approach and wipe out these enemy-controlled areas is up to you, and the game gives you a huge amount of tools to play with. Games often boast about offering player freedom, when really all it amounts to is shooting everyone noisily, or shooting everyone stealthily, but the freedom and scope for creativity in Far Cry 4 is often intoxicating—providing you have an imagination. The new fortresses are like mega-outposts, filled with tough, armoured enemies and alarms, and methodically stealthing your way through one, which can take a long time, is a thrill. But your plans, no matter how well-laid, will inevitably blow up in your face, forcing you to adapt and try something new on the fly. Mixing your weapons, skills, and tools, and random elements like animal attacks or Golden Path soldiers wading into the melee, results in some brilliant, emergent moments. It’s a great story generator. Gyrocopters are particularly useful for taking outposts. You can use them to scout out sniping spots, or just hover over a base and chuck grenades at the guards below. Oh, and you can ride elephants, which is totally absurd, but ridiculously fun. And, of course, this being an Ubisoft game, there are a million other icons littering the map. Some of these are fairly standard open world fare, like checkpoint races and collectables, but others are worth spending time with. The House of Chiffon challenges, which see you hunting rare animals for a creepy fashion designer, are a highlight—particularly the one that sees you ‘fishing’ by dropping C4 into a lake from a gyrocopter. Map-revealing towers are back (again, it is an Ubisoft game after all), and each one presents a unique platforming challenge. There’s basically loads to do. Not all of it is valuable, but the majority of side-quests come with meaningful rewards. Distraction is the game’s forte. You’ll set a map marker on the next story mission, but on the way your attention will be grabbed by a dozen different things. An outpost, a tower, an animal whose skin you need to craft a new wallet, a beautiful vista, or randomly generated missions like enemy convoys that can be ambushed. Some might find the amount of stuff vying for their attention overwhelming, but you’ll just have to have some discipline. I once failed a mission because I stopped to watch an elephant in a lake giving itself a bath. It’ll take the easily distracted a while to finish the game. And all of this—barring story missions—can be played with another person in co-op. This is one of the most enjoyable multiplayer experiences I’ve had for a while, and having another person on hand when assaulting an outpost only expands the already vast amount of ways to clear them. Pilot a gyrocopter and your buddy can grapple onto it and hang from the bottom, letting you, say, drop them on a roof to stealth kill a sniper. Or the two of you can climb onto a pair of elephants and crash into the base, the sound of explosions, screaming, and trumpeting filling the air. The House of Chiffon hunting challenges are great in co-op too. I didn’t experience any connection or lag issues, but I have heard cases of people being kicked out and losing progress. It’s in the scripted missions where Far Cry 4’s biggest weaknesses lie. Amazingly, despite every gamer I’ve ever spoken to saying they hate them, Assassin’s Creed-style tailing missions have made it into the game. And there are far too many insta-fail stealth bits. It wouldn’t be an Ubi game without these, but come on, instant fail states are never fun—and at odds with the open-ended freedom of the outposts. If you get caught sneaking into an enemy base, you should be given the opportunity to adapt and try a new approach, not be thrown back to a previous checkpoint. There are some really great moments in the story—especially your first trip to the dreamlike Shangri-La—but I can’t help but feel the campaigns in these games should be built around the outpost missions, and not separate, scripted entities. It’s here where the game and its interacting systems really shine. Another issue—but one I quickly got over—is familiarity. If you look at the first three Far Cries, they all feel like different games. But Far Cry 4 is quite obviously an iteration of Far Cry 3, rather than any kind of progressive sequel. There are a lot of shared animations, reused mission templates, and other, smaller details anyone who spent a lot of time on Rook Island will recognise. But I loved Far Cry 3, so I don’t care. There are more toys to play with, the world is more fun to traverse, the story is infinitely better, and everything just feels tighter and more focused. A built-in map editor tops the package off, which lets you create and share your own outposts and hunting challenges. A lot has been written about Far Cry 4’s setting, its eccentric villain, and its rideable elephants, but they’re all secondary to the fact that, at its core, this is just a brilliant, well-designed shooter. The weapons feel great, there’s genuine opportunities for creativity, and it all takes place in a dynamic world where random tiger attacks are commonplace. There are some weak scripted missions to endure in the story, but the scope and variety of Kyrat more than makes up for it.